Leather is a luxurious material that can be used in a variety of applications, including clothing, shoes and home decorating. However, for some people, finding an alternative to leather, particularly when it comes to home decorating, can be a priority. Faux leather fabrics, which are usually made from plastic or vinyl-based materials, have many benefits and can be used in all the same ways that leather can. In some cases, using faux leather to decorate your home may even be better option than genuine leather. Faux leather is available in a rainbow of colors so it has many design possibilities. One of the most significant benefits to using faux leather to decorate your home is that it is much more affordable than genuine leather. In fact, you can usually find faux leather at a fraction of the cost of real leather. However, because it looks just like genuine leather, you do not have to sacrifice on the appearance. It also means that you may be able to buy more faux leather material and tackle larger decorating projects that you might not be able to afford if you used genuine leather. For animal lovers, using faux leather in place of the genuine article may be a no brainer. Faux leather material is synthetic and produced in a factory. No animal parts are used in its production, so no animals are harmed during its production. As a result, you can enjoy the sleek, attractive look of leather without feeling any guilt. Faux leather materials such as vinyl are ideal for use in your home furnishings because they are low maintenance. They are usually stain-and fade-resistant, so you do not have to worry about them around children or pets. Faux leather is easy to clean as well and can usually be wiped clean with a rag and warm water. Unlike genuine leather, it does not retain moisture, so you do not have to worry about your faux leather items becoming warped or cracked. Because faux leather is man-made, it has a consistent look throughout the material. 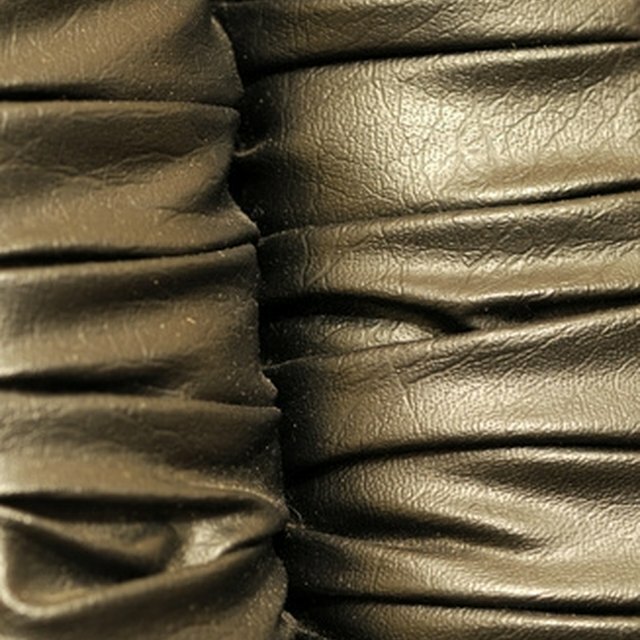 Genuine leather often has a mottled appearance, which is often ideal for creating distinct items. However, if you want a uniform look, faux leather is a better option because all of the pieces made from the material will have the same look. In addition, because faux leather is a synthetic material, it can be dyed a rainbow of colors. If you want to upholster your ottoman in hot pink, purple or turquoise, you will be able to find a faux leather material in the ideal shade. If you are planning sewing projects, faux leather may actually be a better option than real leather. Faux leather is easier to cut and sew, and needle marks are usually much less noticeable as well. You may also find that thread blends with the materials more seamlessly. Because it is so easy to work with, you can use faux leather for a variety of projects, from making clothing to covering your headboard. Can You Put Leather Sneakers in the Dryer?